The descending trend continues. 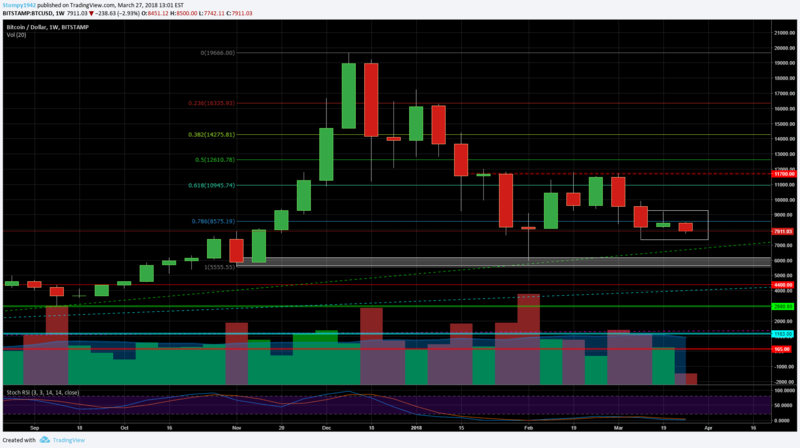 It appears that Bitcoin is struggling around the $8,000 support level. Although, since the beginning of the sharp declines it looks like the market is stabilizing and perhaps these are signs of a coming relaxation. But, markets are still considered to be bearish and unpredictable. Every stabilization is followed by a dump and as we know Bitcoin, a real change of trend will probably come and it will take place in the most unexpected way. The Bitcoin dominance over altcoins has increased by 5% since the beginning of March and the effects are felt in a the vast majority of the crypto market. Ethereum has lost 6% against Bitcoin and 14% against USD. 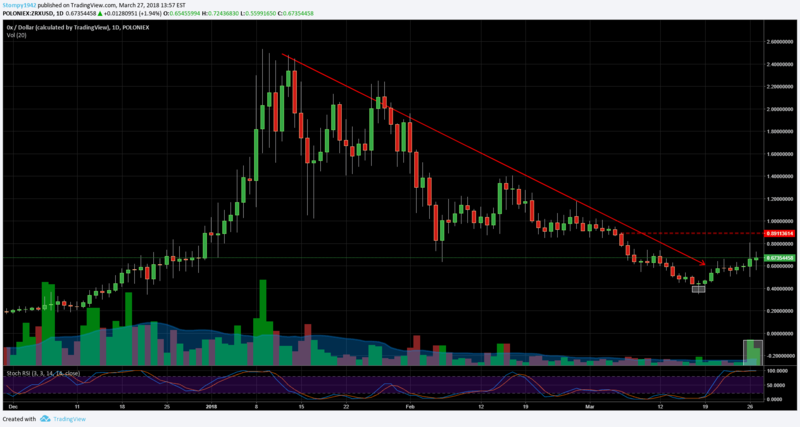 Other Alts showed mixed trend, while some gave a little comfort to their holder, such as BNB, TRON and ICON. 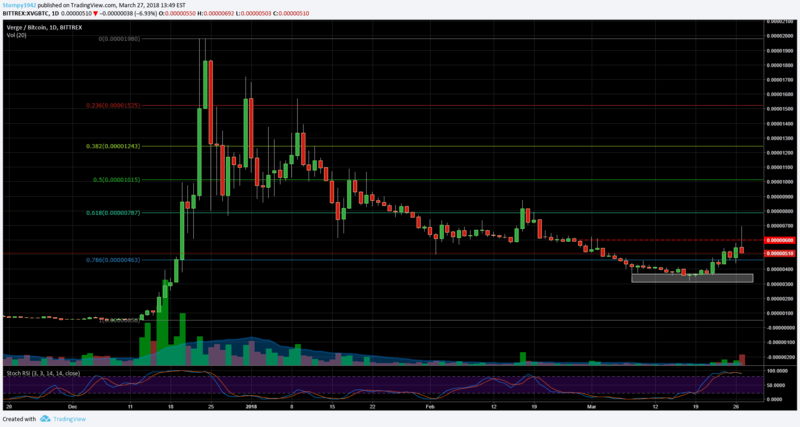 It seems that the market is hungry for Altcoin trading, especially trading of new ones. The older coins are still in the middle of their declines. Edward Snowden, one of the world’s most notorious whistleblowers, handed over NSA documents to the site The Intercept, unveiling a covert operation to track down the identity of bitcoin users. Tether, the notorious “stable coin,” that has come under fire from the SEC, printed an additional 3000,000,000 USDT coins, coming after a short hiatus since the 23rd of January. The most recent draft of a G20 document reads that cryptocurrencies “lack the traits of sovereign currencies,” meaning that G20 considers cryptos to be the same as assets rather than currencies. A Dutch court classified Bitcoin as having “transferable value,” which is due to a recent court ruling who was owed 0.591 bitcoins. Binance, one of the world’s largest cryptocurrency exchanges, is opening an office in Malta, which is an island located off the coast of Europe. Binance’s CEO, Zhao Changpeng said that Binance will open a “fiat-to-crypto exchange,” and that it is close to securing a deal with local banks for deposits and withdrawals. The prime minister of Malta has reportedly welcomed the move with open arms. According to column by Forbes, banking institutions could eventually adopt the cryptocurrencies Bitcoin and Ripple, as cryptos are presently in competition with banks. “If big banks were to succeed in crushing one of these two currencies, Ripple would be it,” says Shidan Gouran, President and COO of Global Blockchain. The holding company of Canada’s Toronto Stock Exchange (RSE), the ninth-largest in the world, is preparing to launch its trading platform for cryptocurrencies, beginning with Bitcoin and Ethereum. In Russia, a new law designed to protect the rights of cryptocurrency payments has been drafted into Russia’s parliament. The bill defines words like “digital money,” and will allow Russian tax authorities to outline processes for taxation, inheritance rights, and bankruptcy claims. Kakao Corp, one of South Korea’s largest mobile messaging applications said it will tap it expand into overseas markets and widen its services to include blockchain technology. Traded around $ 7900. 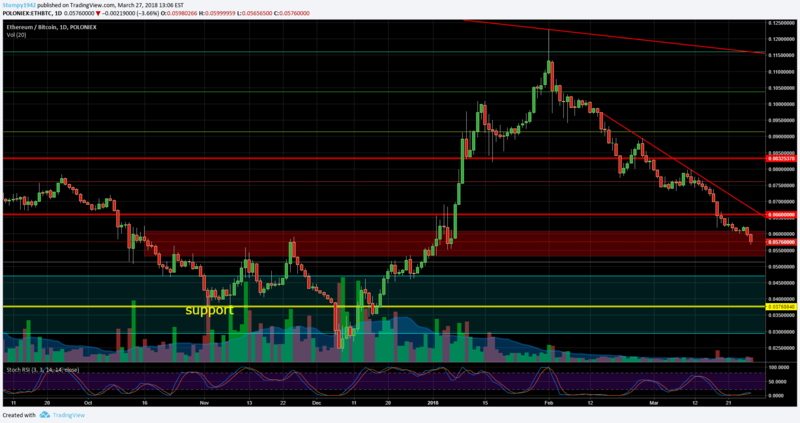 Are we going to lose the $ 8000 support level? It does not seem to happen so fast… BTC Trading has been around this price for the past week with slight declines. The weekly chart shows a moderation in Bitcoin’s volatility over the past two weeks. 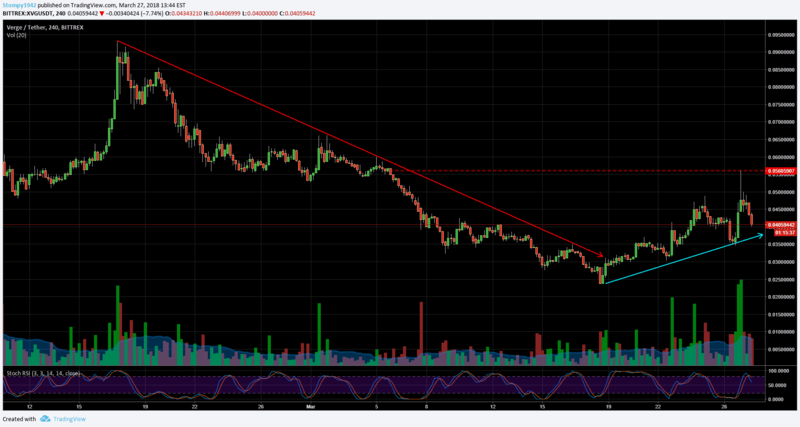 Resistance is being built around $8,500 in the short term. Support lies at $ 7700. Against the dollar, the support around $500 did not hold. 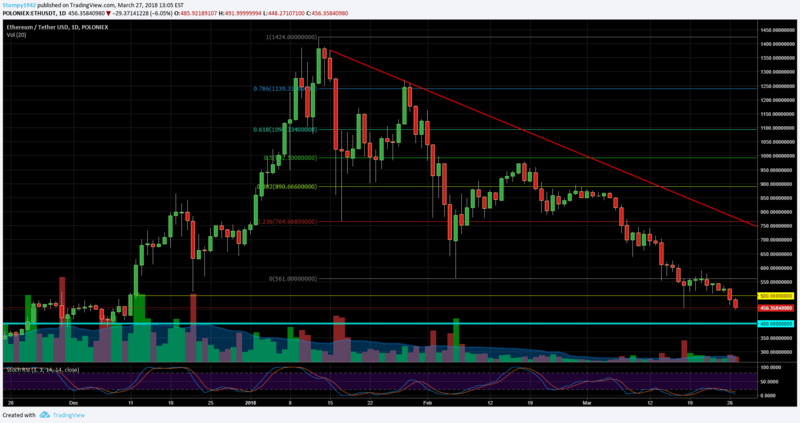 Now ETH gets supported around $ 450, resistance level lies at $500. Getting closer to the $400 support level, last time we broke this level, ETH found a new all-time high at over $1,200. 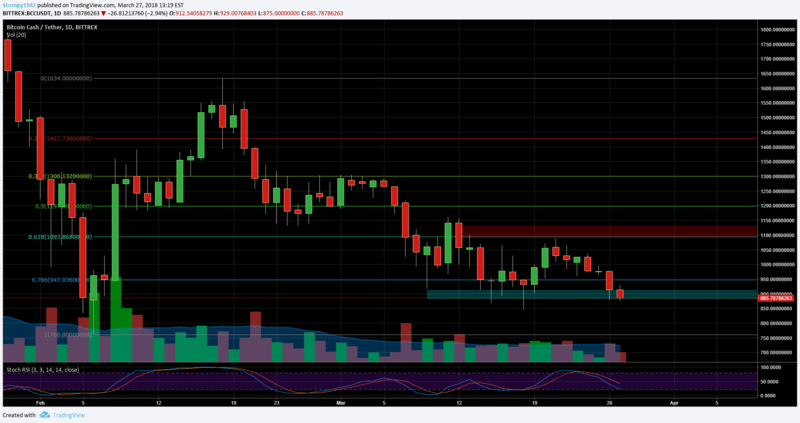 Against Bitcoin, the red candles continue: 0.06BTC support did not hold and in recent days it appears that the price is looking to find support in the reversal areas (marked in red). Hence, if high demands don’t appear, the price may plunge to the low levels of November. Against the dollar, the overall trend is down. Resistance at $ 950 in the closer range. Against Bitcoin, the price lost around 5% this week. This is considered relatively stable compared to the rest of the other altcoins. As seen in the graph, the price is ranging between 0.11BTC and 0.123BTC for the past month. Against the dollar, the January ATH of $ 91 seems really far away. The price plunged to a low of $ 14.5. The weekly chart shows the support was built before the last rise, which in the meantime, holds around $ 20. Resistance level is at $ 28. Against Bitcoin, the weekly chart has a continuous downward correction since May 2017. 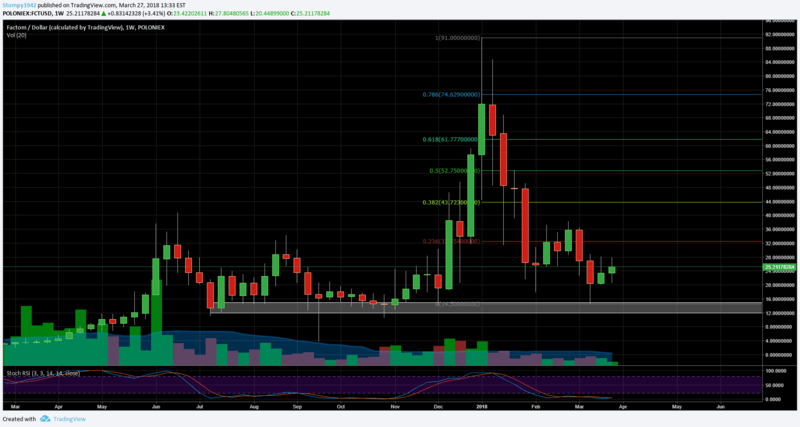 Traded around 0.0031BTC right where the resistance areas are at, according to Fibonacci retracement levels. 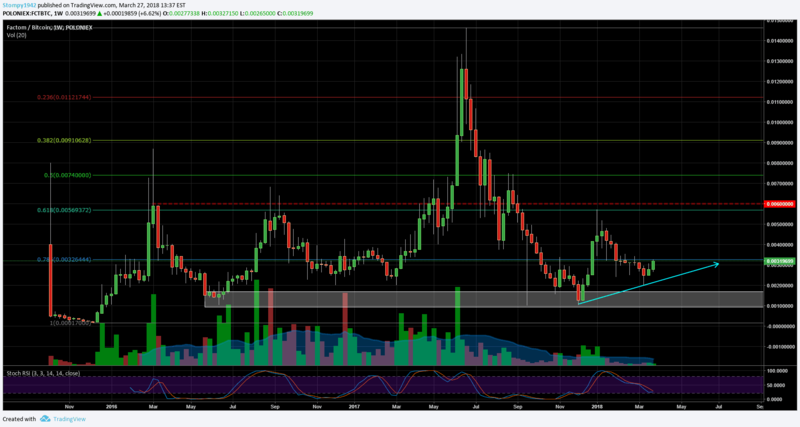 Support this range is around 0.0025BTC. Is Factom on the way to a new rally? Or will you continue to bleed like the rest of the market? Against the dollar, traded around 4 cents with support at around 3 cents. It seems that a momentum change had began in mid-March. The rise was followed by relatively high volume. Resistance is at 5 cents. A break of this level and we can reach higher levels. Against Bitcoin, the down trend has dominated since December – where the all-time high was around 1980SAT. We are experiencing a continuous increase since 330SAT. 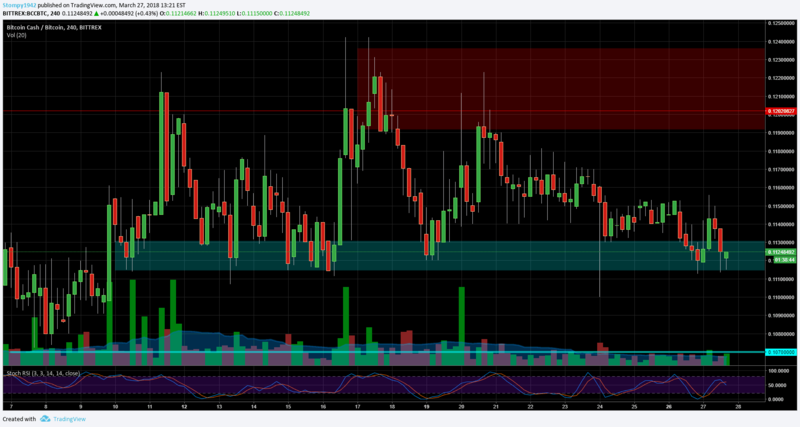 Now traded around 500SAT with resistance at 600SAT in this range. Against the dollar, as in most coins, dropped in its value during the past week. A recent rally led to a momentum that started at $ 0.4. 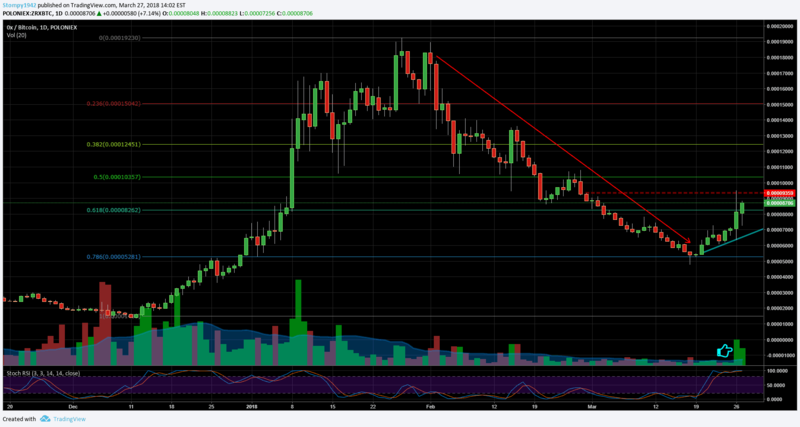 From there a rise of 100% to 0.8$ where resistance lies. Against the Bitcoin, traded around 8700SAT, resistance is at 9300 SAT support is being built around 7000SAT in a positive trend. The post Market Update Report Mar.27 appeared first on CryptoPotato.